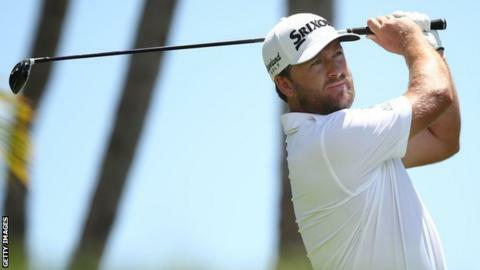 Graeme McDowell says his win in the Corales Puntacana Resort and Club Championship ends "a rough few years". The Northern Irishman brought a four-year wait for a victory to an end by shooting a final-round 69 to clinch a one-shot win in the PGA Tour event in the Dominican Republic. The win takes McDowell from 257 in the world rankings to inside the top 150. "This is big - big for the people who stood by me and the sponsors who stood by me. It has been a grind," he said. "It has been a rough few years. I'm really happy I got this done." The former US Open champion finished 18 under, with Canada's Mackenzie Hughes and American Chris Stroud tying for second. McDowell's triumph earns him a two-year PGA Tour exemption. The Portrush player, who started the final round with a one-stroke lead, fell behind Stroud, but while Stroud bogeyed the par-three 17th, playing partner McDowell hit a superb tee shot to six feet and converted the birdie putt before both players bogeyed the 18th. "I stood on the 16th and said to myself 'you've got to do something that's tournament winning' and that shot to 17 was tournament winning level," said the 39-year-old. "I'd been struggling with my medium-iron and long-iron play all week and it was a shot I'd been working on on the range over the last few days. "It was a perfect six-iron for me, it was a perfect number for me and when it came off the bat I knew it was pretty good." The event was contested by players who did not qualify for the WGC Match Play event in Texas, a tournament won by American Kevin Kisner.